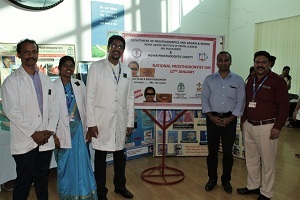 National Prosthodontist Day commemoration was held on 24th January 2019 by Department of Prosthodontics, Indira Gandhi Institute of Dental Sciences (IGIDS), Sri Balaji Vidyapeeth. The programme was conducted under the banner of Sri Balaji Vidyapeeth for a health education series – Arokyam Arivom. The commemoration events were coordinated by Dr. Manoharan, Professor, and Head, Dept. of Prosthodontics, Indira Gandhi Institute of Dental Sciences, Sri Balaji Vidyapeeth. A team of faculties along with the postgraduate and undergraduate students celebrated by cake cutting to inculcate the spirit of the discipline. The afternoon session had an educational awareness talk by Dr. Rajkumar, Reader, on the importance of replacement of teeth and various treatment options available for edentulousness. General outpatients of the hospital attended the programme. They were also exposed to stalls which had models and charts along with one on one session for people who had clarifications. A smile contest was organized which encouraged the outpatients and the students to flash their smile and won prizes in both categories. The students also submitted posters on patient education about prosthodontics. Prizes were awarded for the best poster. A pictorial Quiz was conducted by Dr. David Livingstone, Professor and Dr. Sanchayitha, postgraduate student, for the undergraduate students of IGIDS. Prizes were awarded for the winners of the pictorial quiz.